Before the invention of the electron microscope, cells were generally classified as either plant cells or animal cells. The reason for this, is that plant and animal cells are relatively large eukaryotic cells that could be easily seen using the magnifying power of the compound light microscope. As science and technology continued to advance, smaller cells were discovered. These included protists, fungi and bacteria. Prokaryotes vs Eukaryotes After the invention of the electron microscope, it soon became clear that bacteria (and much later, archaea) are indeed cells, similar to the plant and animal cells already known at the time. However, there were fundamental differences between these bacteria cells and the eukaryotic cells, which include the cells of plants, fungi, algae and animals. As microorganisms were discovered and studied by the pioneers of microbiology, it soon became clear that the "two-kingdom" system could not accommodate these new single-celled life-forms. Ernst Haeckel combined these tiny microorganisms into a separate third kingdom, called the Protista. 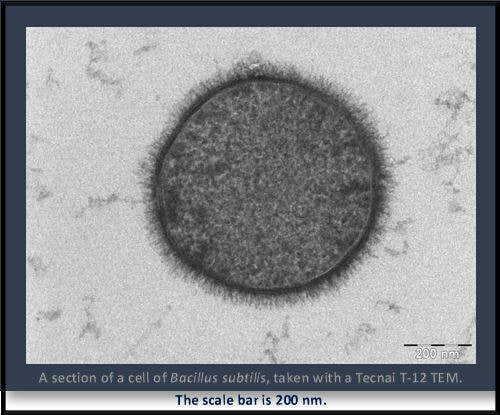 As the field of microscopy continued to advance with increasingly more powerful light microscopes, and eventually the electron microscope, the differences between bacteria and other microorganisms became more clear. The 5 kingdom system was in place for while as one of the more successful classifications of the 20th century. In 1977, evolutionary biologist Carl Woese, discovered a new type of cell that existed as a single-celled organism. 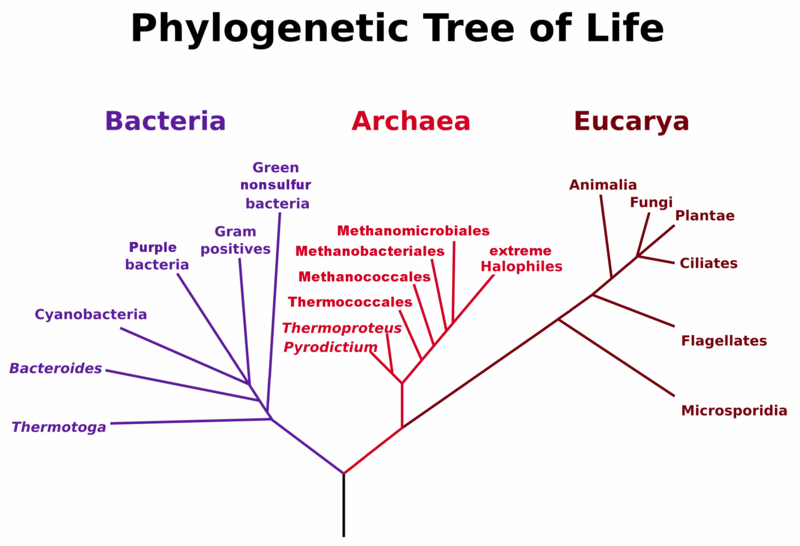 Carl Woese made this discovery during his work comparing the nucleotide sequences of different types of cells, to uncover phylogenic relationships. Phylogeny is a diagrammatic hypothesis (giving us our phylogenic tree) about the history of the evolutionary relationships of a group of organisms, based on DNA evidence, morphological and physiological characteristics. 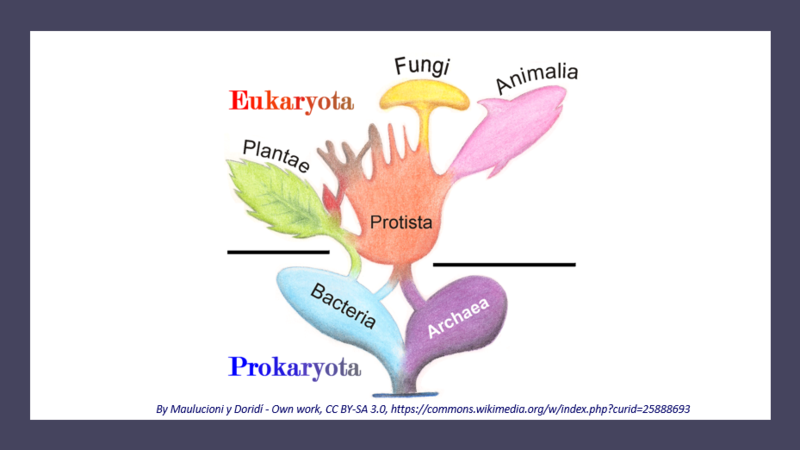 The English Spelling for Eukaryotic and Prokaryotic is "Eucaryotic" and "Procaryotic"
Bacteria cells were known at the time, but there was another type of cell that was distinctly unique from both the eukaryotic cells and the bacteria cells. Carl Woese originally called this newly discovered group of single-celled organisms archaebacteria, which translates to "ancient bacteria". There was a campaign to change the taxonomic structure of the day to include a third domain for the archaebacteria. Taxonomy the word taxonomy comes from the Greeks words meaning "method" and "arrangement". It is the science of categorizing, defining and naming groups of organisms based on common genetic, morphological, and/or physiological characteristics. Eventually, in light of the overwhelming scientific evidence, the taxonomic structure was finally reorganized into the 3-domain system we know today. To further distinguish the archaebacteria as a separate domain from bacteria, the name was changed to simply, "archaea". 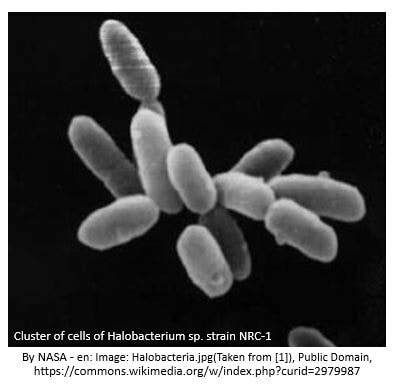 Most bacterial cells contain a single, circular chromosome that exists in the nucleoid region of the cytoplasm. Eukaryotic cells contain multiple linear chromosomes that are housed within the nucleus of the cell. Eukaryotic cells are compartmentalized. They have a nucleus which is separated from the cytoplasm by a nuclear membrane or nuclear envelope. Eukaryotic cells also contain many membrane-bound organelles. ​The cell membrane protects the cell by creating a barrier between what is inside the cell and what is outside the cell. The structure of the cell membrane in bacteria cells and eukaryotic cells is very similar. 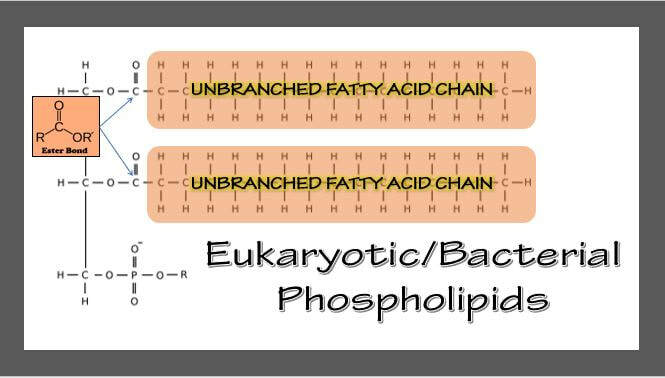 The cell membrane in eukaryotic cells and bacteria cell is made up of a double layer of phospholipids. 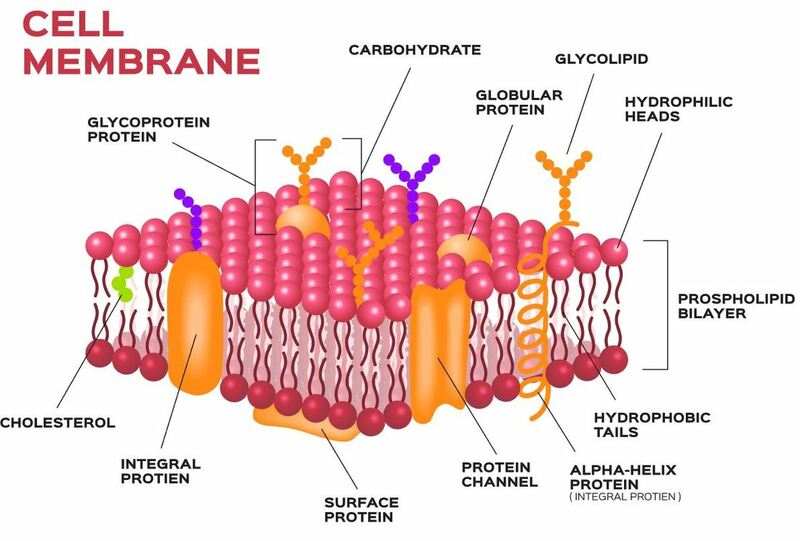 Proteins, sugars and lipids are also incorporated into the cell membrane. The fatty acid tails orient themselves toward each other, to get away from the water. 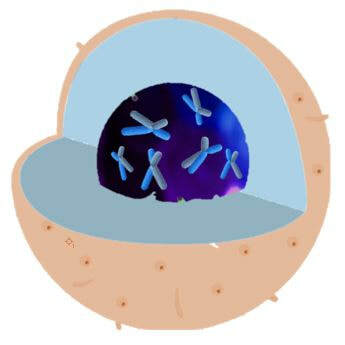 This provides a barrier between the inside of the cell and the outside of the cell. 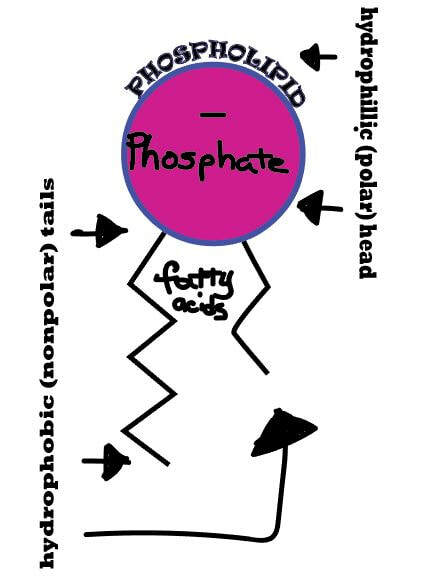 The components of phospholipids include 2 hydrophobic fatty acid tails and a hydrophilic head. The tails consists of UNBRANCHED fatty acid chains that consist of hydrocarbons (H-C). The fatty acids give a hydrophobic barrier that orients itself away from the intracellular fluid and the extracellular fluid. The hydrophilic heads are in contact with the inner and outer liquid medium. The hydrophilic heads consist of choline, phosphate, and glycerol. 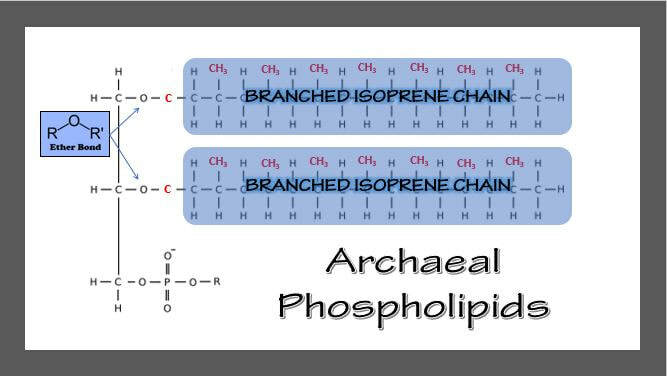 ​ In contrast, the phospholipids in archaeal cells contain BRANCHED ISOPRENE CHAINS instead of the unbranched fatty acid chains we see in bacteria and eukaryotic cells. 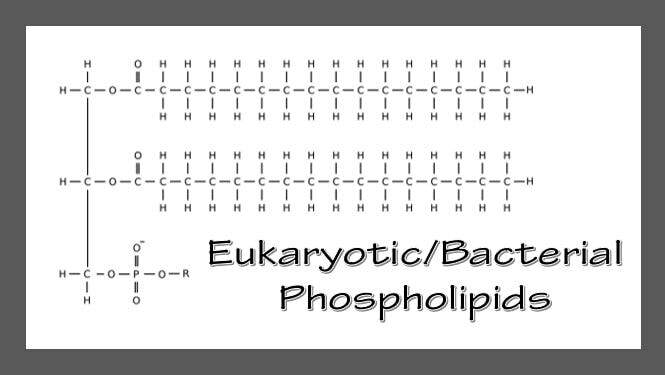 In archaeal cells, the phospholipids contain ether bonds instead of ester bonds. Archaea are extremely diverse and have adapted to many extreme habitats. Some forms have evolved to survive off of odd forms of nutrition such as sulfur and cyanide. Many members of the Archaea are found in extreme environments and are called "extremophiles". Some species of archaea can be found inside glacial ice in freezing temperatures. Others are found in deep-sea thermal vents feasting on sulfur bubbling up from the Earth, in a habitat where sunlight never reaches. Some species called thermophiles love the heat and are able to grow at temperatures well over 100 ◦C, that would boil water. There are examples of archaeal organisms that can survive or even prefer extreme levels of salinity, pH, or pressure. 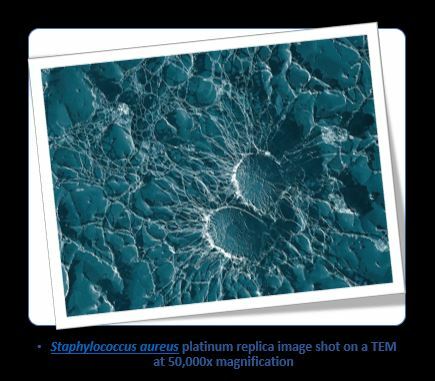 Peptidoglycan (cell wall) Provides bacterial shape and rigidity. The cell wall consists of alternating units of N-acetylglucosamine and N-acetylmuramic acid. The polysaccharide chains are cross-linked by a peptide bridge. It is a primary target of antimicrobial therapy – because it is specific to prokaryotes. 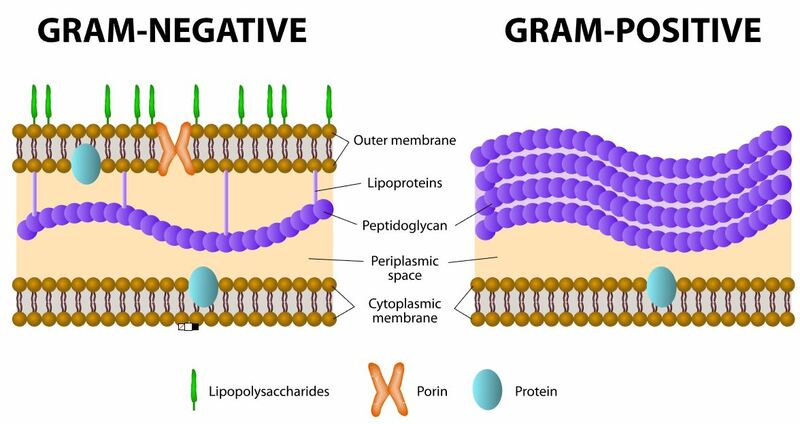 If they have a cell wall, it will contain some amount (either thick or thin) of peptidoglycan. Capsule: This polysaccharide outer coating of the bacterial surface often plays a role in preventing phagocytosis of bacteria. Like bacteria, archaeans have no internal membranes and their DNA exists as a single loop. As with other living things, archaeal cells have an outer cell membrane that serves as a barrier between the cell and its environment. Within the membrane is the cytoplasm, where the living functions of the archeon take place and where the DNA is located. 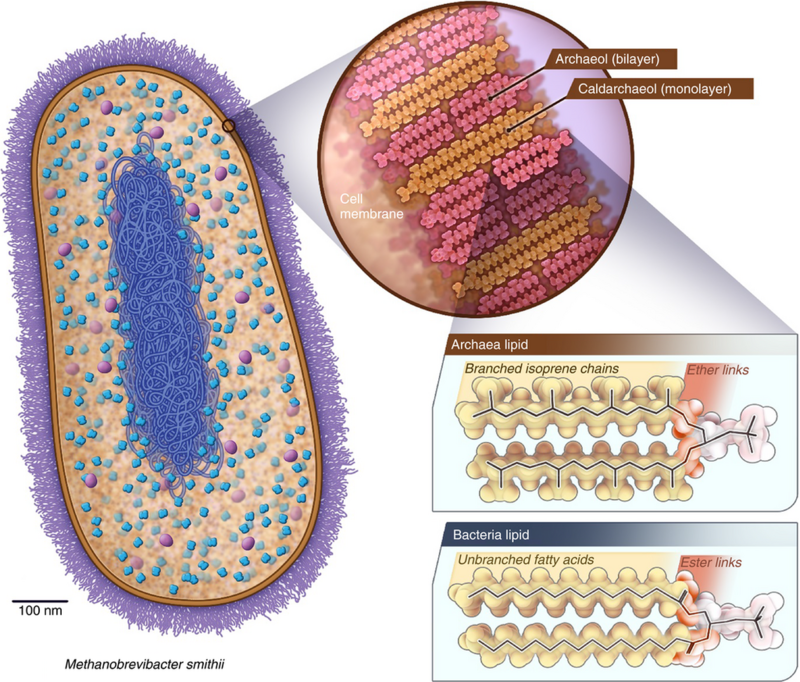 Around the outside of nearly all archaeal cells is a cell wall, a semi-rigid layer that helps the cell maintain its shape and chemical equilibrium. All three of these regions may be distinguished in the cells of bacteria and most other living things, but when you take a closer look at each region, you find that the similarities are merely structural, not chemical. In other words, Archaea build the same structures as other organisms, but they build them from different chemical components. For instance, the cell walls of all bacteria contain the chemical peptidoglycan. 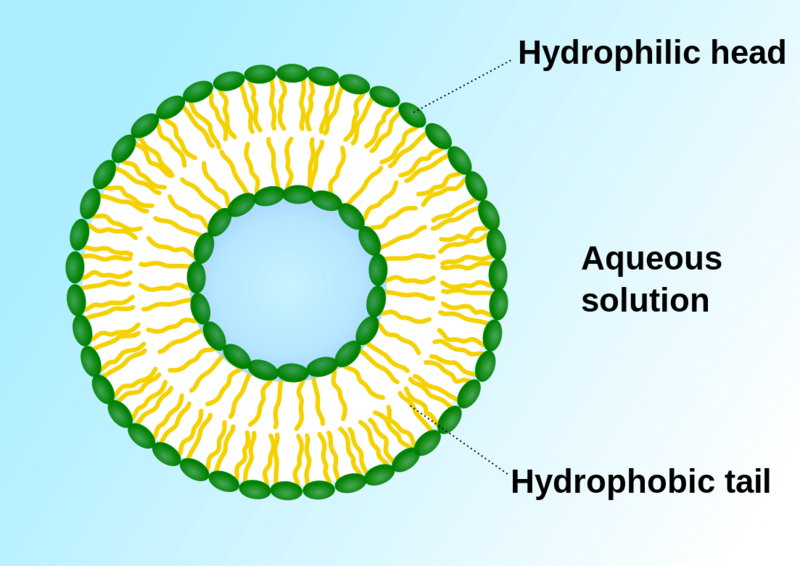 Archaeal cell walls do not contain this compound, though some species contain a similar one. Likewise, archaea do not produce walls of cellulose (as do plants) or chitin (as do fungi). The cell wall of archaeans is chemically distinct.